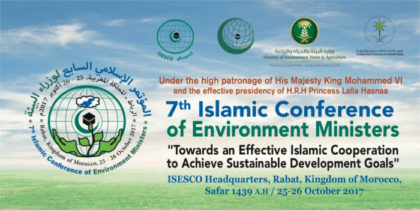 The 7th conference of environment ministers of ISESCO member states adopted the draft Rabat Declaration on Environment Protection and Achieving Sustainable Development Goals, which stressed the importance of a renewed commitment by the Member States to supporting the international agenda for sustainable development, in accordance with the regionally and internationally agreed principles and instruments. The Declaration calls for channeling all national and international efforts into sustainable development, for honoring the financial and technical commitments, and establishing national structures for sustainable development or strengthening those existing in every Member State. It also stresses the need to uphold the implementation of sustainable development plans and programs with internal follow-up bodies to optimize their implementation, and to involve civil society organizations and the private sector in the implementation of sustainable development plans, given their crucial role in this regard. The Declaration commend the effective contribution of the UN environmental bodies and the Arab and Islamic specialized organizations to supporting the efforts of the Member States in the relevant areas, with a view to implementing sustainable development projects, and urged the international community to take concrete steps to ensure debt cancellation, easy access to markets, technology transfer and capacity building. The participating delegations emphasized the necessity for activating the recommendations of the Paris and Marrakesh Conferences of the Parties on climate change, particularly as regards the support funds as part of North-South solidarity to address the effects of this phenomenon. They likewise underscored the need for developed countries to assume their environmental responsibilities, take resolute measures in accordance with the UN Framework Convention on Climate Change and its Kyoto Protocol, and pay more attention to the degradation of biodiversity and natural habitat around the world. This degradation causes even more economic loss than global warming according to UN relevant reports, through managing water and air pollution and disposal of dangerous pollutants in watercourses, as they lead to water depletion and disrupt biodiversity, the Declaration states. The conferees announced the adoption of the “Guidance Document on Green Cities and their Role in Achieving Sustainable Development Goals”. 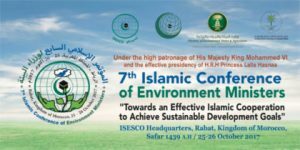 The Rabat Conference also highlighted by the launch of the “Program for the Celebration of Islamic Capitals of the Environment and Sustainable Development” to be supervised by ISESCO. The Saudi Award for Environmental Management in the Islamic World, chaired by the General Authority of Meteorology and Environmental Protection and whose General Secretariat is entrusted to ISESCO, on its part announced the creation of a fifth prize dedicated to green cities. The opening session of the event highlighted by the reading out of a message by King Mohammed VI who stressed the top priority Morocco grants to the issue of environment protection in a bid to tackle the environment degradation and combat climate change. In a message read out by the King’s youngest sister and Chairwoman of the Mohammev VI Foundation for Environment Protection Princess Lalla Hasnaa, the Moroccan Sovereign said climate change, which is affecting the entire globe, is one of the most crucial environmental issues today since it impacts directly a number of vital sectors, such as agriculture, transport, water and natural resources. Written by: Jaber Ali on October 26, 2017. Posted by Jaber Ali on Oct 26 2017. Filed under Gulf News, Headlines, World News. You can follow any responses to this entry through the RSS 2.0. Both comments and pings are currently closed.